We’re on a quest to bring you the best wood-fired pizza you’ve ever tasted, and now it’s never been easier to get your hands on a delicious pie. 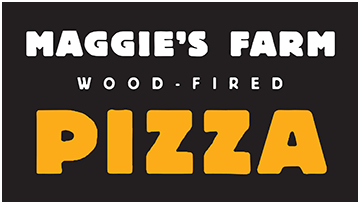 Maggie’s Farm Pizza opened in August 2017 in Iowa City — our first brick-and-mortar location after operating out of Cedar Rapids’ NewBo City Market and the Iowa City Farmers’ Market. We couldn’t be more excited for you to come visit our brand-new Iowa City location at 1308 Melrose Avenue and experience the wonder that is wood-fired pizza. Remarkable pizzas across the U.S.
Co-owners Jerry and Carolyn are passionate about pizza, and Maggie’s wouldn’t be Maggie’s without inspiration from some of the greats. With that, we tip our hat to some of the best pizza joints across the country — hand-picked by Jerry and Carolyn for their must-try pies.